In 1911, Tordenskjold, a 75-foot schooner hewed from old-growth fir, left the Ballard, Wash., docks for its first season of halibut fishing off Alaska. Back then, sails supplemented the power of a feeble two-cylinder gas engine and the crew fished from small dories that launched over the side into the perilous North Pacific waters. Today, the Tordenskjold runs on diesel and the dories are long gone. But this boat still heads north each spring to join in a halibut harvest that during the last century has helped establish Ballard as a hub of the North American fishing industry. 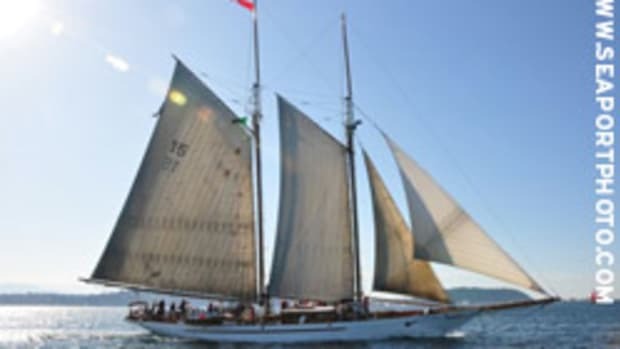 Last week, as the Tordenskjold prepared for its 99th season, the boat joined six other fishing schooners for a rare fleet parade through Lake Union, the Ballard Locks and out into Puget Sound.